When it comes to the ‘Define Purpose’ or ‘Decide Strategy’ or ‘Continuous Improvement’ or ‘Creative Thinking’ elements of my #WP2P approach to total workload management, we often need to think outside the box in order to come up with a solution to a situation. The challenge is that we face many constraints in arriving at a solution and we often have to do this when we are already under pressure to deliver other work. Few of us find it easy to be instantaneously creative at work, that’s why models and frameworks for our thinking are so useful. It is question based. 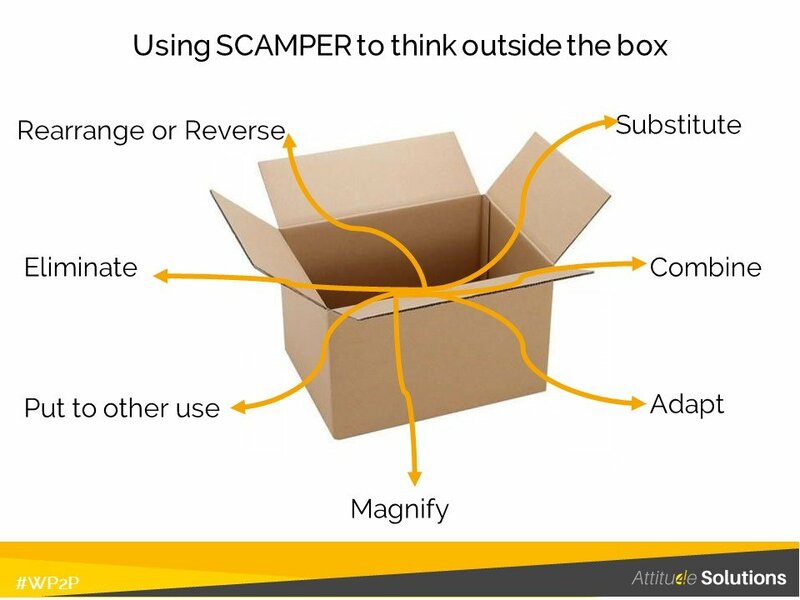 The idea is to ask ourselves questions based on the Scamper mnemonic. It can be applied to physical products, services and even personal situations equally successfully. The general consensus is that our ‘Thinking’ and ‘Problem solving’ work is best conducted away from the immediate demands of our operational work. This could be a physical removal to a quiet room. If this is not possible, it can be useful to deliberately get up and move our bodies before getting into our thinking zone. It is important to disable all interruption stimuli, so email off, phone and mobile to silent and voicemail mode. When using this approach, avoid the temptation to immediately come up with ‘ideas’. Work through each element of the mnemonic, asking great questions – see examples below. When you have run through the mnemonic you can then engage other thinking to arrive at a ‘solution’. What materials or resources can you substitute or swap to improve the product, service or situation? What other product, service or process could you use? Can you use this product or service somewhere else, or as a substitute for something else? What will happen if you change your feelings or attitude toward this product, service or situation? What would happen if you combined this product service or situation with another? What could you combine to maximize the uses of this product service or situation? How could you adapt or readjust this product service or situation to serve another purpose or use? What else is the product service or situation like? Who or what could you emulate to adapt this product service or situation? What else is like your product service or situation? What other context could you put your product service or situation into? What other products services or ideas could you use for inspiration? Can you use this product or service somewhere else, perhaps in another industry? Who else could use this product or service? How would this product or service behave differently in another setting? Could you recycle the waste from this product or service to make something new? How could you streamline or simplify this product service or situation? What would happen if you took away part of this product or service? What would you have in its place? What components could you substitute to change the order of this product or service? How could you reorganize this product service or situation?